Layer cakes are always well received and they seem to make any get together a little more special. This two layered White Butter Cake is no exception. It's buttery sweet and I like to sandwich the two layers together with raspberry jam and a tangy sweet cream cheese frosting. The frosting is also used to cover and decorate the cake. I often pile some fresh berries in the center of the cake which makes it look so beautiful. This White Butter Cake recipe is made using the 'combination' method' of mixing. This method is similar to the 'creaming' method the only difference being that the eggs are first separated, and while the egg yolks are added to the beaten butter and sugar mixture, the egg whites are beaten separately and are then folded into the batter. You will find that this produces a cake that has additional volume and lighter texture than with the 'creaming' method. We use cake flour in this recipe which gives the cake a soft and tender crumb. You can make your own cake flour by combining all purpose flour with cornstarch. To make 1 3/4 cups sifted cake flour, take 1 3/4 cups sifted all purpose flour and remove 3 1/2 tablespoons of the flour and replace it with 3 1/2 tablespoons cornstarch. If measuring by weight then you will need 150 grams of all purpose flour and 25 grams cornstarch. While you can fill and frost the cake layers once they have been baked and cooled, I have gotten into the habit of first placing the layers of cake in the freezer or refrigerator for about 30 minutes to firm up the cakes. This extra step makes the spreading of the frosting a much easier task. For a freshly baked cake is quite fragile and when you try to spread the frosting there is a tendency for it to tear. White Butter Cake: Preheat your oven to 350 degrees F (180 degrees C) and place your oven rack in the center of the oven. Butter and flour two - 8 inch (20 cm) round cake pans. Line the bottoms of the pans with parchment paper. 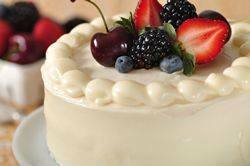 Cream Cheese Frosting: In your electric mixer, fitted with the paddle attachment, beat the butter and cream cheese together until nice and smooth with no lumps. Add the confectioners' sugar and beat until well combined. Scrape down the sides of the bowl as needed. Add the zest (if using) and vanilla extract and beat on high speed until the frosting is light and fluffy. Serves about 10 - 12 people.